« Help us ILLUMINATE PARKINSON’S on March 23rd! The days of circuses, carnivals, vaudeville, cabarets, and early cinema have always held a hypnotic sway over me and I’ve been obsessed with them since my childhood. Of particular interest are the sideshow attractions and freak shows. The wondrously bizarre, beautiful, and grotesque world of sideshow freaks has been a source of fascination and controversy from the time of their inception in the 19th Century, though circuses themselves date back to ancient Graeco-Roman traditions. While today we may not have direct access to the theatrical spectacle of circus sideshows, at least not the ones that proliferated in the late 19th and early 20th Centuries and which focused on physical abnormalities, we do have certain portals into that world of entertainment that existed in the dark shadows of The Big Top. Aside from modern sideshow attractions, which focus more on physical performance than physical deformity, there have been numerous films and works of art that have attempted to pay homage or preserve the atmospheric ambiance, the eccentric characters, and unbelievable world of circuses and their inhabitants. Perhaps the strange allure of the sideshow can be reduced to the simple dynamics of exhibition and exploitation, but then again, most forms of art and expression can. What is it that makes carnivals and circuses so tantalizingly mysterious to the outside world? Perhaps the circus is the exaggerated reality that lies just beyond the periphery of our accepted social sphere. It at once allows us a glimpse into an environment where everything is heightened, pushed to the limit (and sometimes far surpasses it), and while things may be familiar, nothing is really the same as in the lives that we know. Though it isn’t feasible to escape our frustratingly mundane personal realities and simply “run away to join the circus”, it is possible to seek inspiration and escapism within the world of freaks and carnies. Taking inspiration from this spectacular world is exactly what Gail Potocki has done. Begun in 2009, the Freaks portraits series is an ongoing project for Gail, and only a few of her amazing portraits have been revealed and even more have yet to be created. The brilliant portraits are like a peephole into the circus tents of the past. Not only do they shine the spotlight on some truly unusual characters, but they also expose their humanity in a way that is both profound and endearing. Each portrait embraces its subject as an individual, both celebrating their differences and acknowledging their humanity, and all the while doing so in a playfully creative manner that is fitting of Gail’s symbolist style. The first five “Freaks” paintings by Gail Potocki! 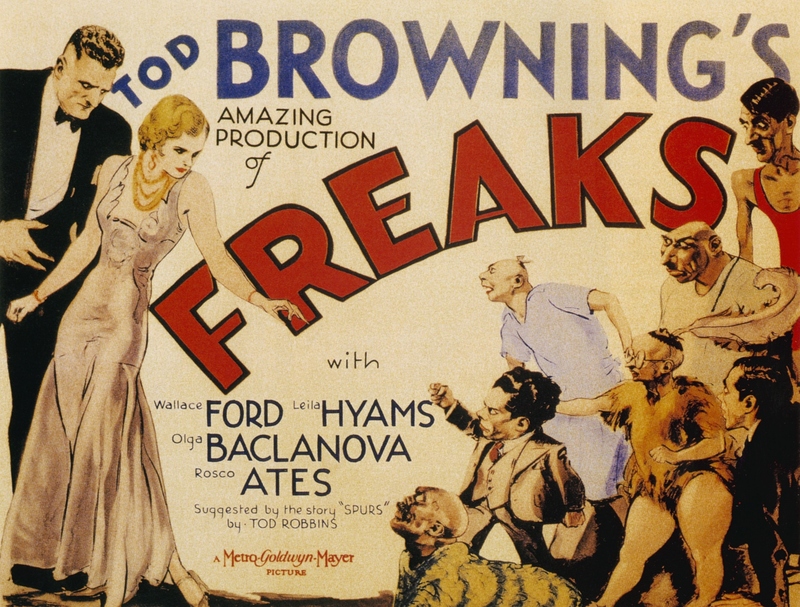 The film Freaks, directed by Tod Browning and featuring real circus performers and actors with physical abnormalities, was released in theatres briefly in 1932 before being pulled out of distribution by MGM out of concern for the controversy surrounding it and the growing pressure for industry censorship in movies. Since its initial release and critical and commercial failure, the film has become an enduring cult classic, mainly due to the counter-culture movement of the 1960s, which saw the film as a sympathetic portrayal of outsiders being plotted against by the scheming “normal” people. For those looking to individuate or just appear hip, the derogatory term “freak” was conversely turned into a superlative and an exclamatory resounding of approval. Today, the film is seen as a peculiarity by most, but a welcome one that is enjoyable for its outlandish story and somewhat subversive message. The film poster from the often controversial classic film “Freaks”. Indeed, and now you can even collect them for your own cabinet of curiosities! 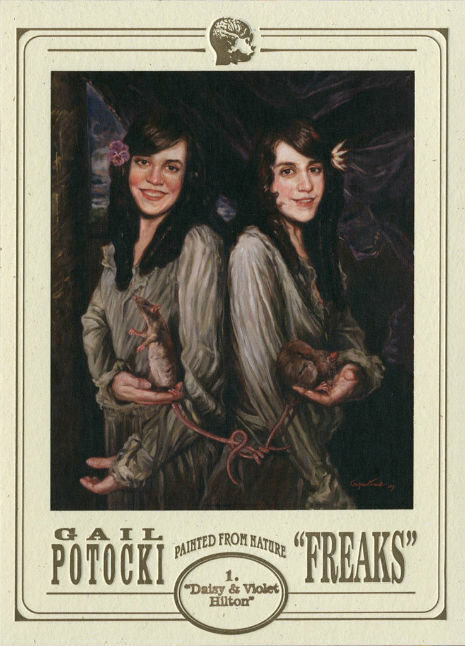 Gail Potocki‘s Freaks are available as both an ongoing series of trading cards and as fashionably original t-shirts. 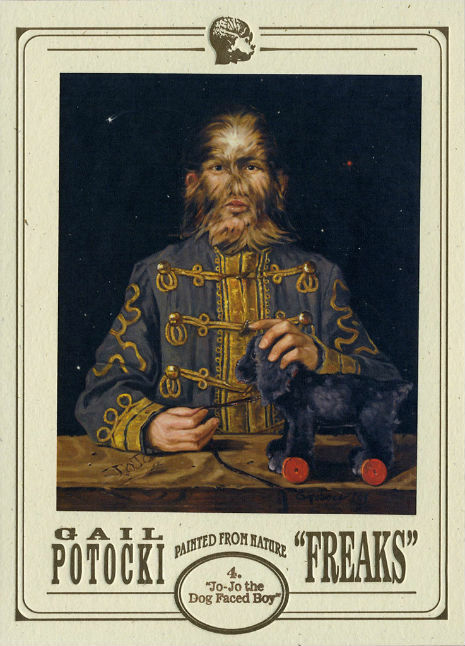 Proudly display your own status as a “freak” with these great collectible cards and apparel. 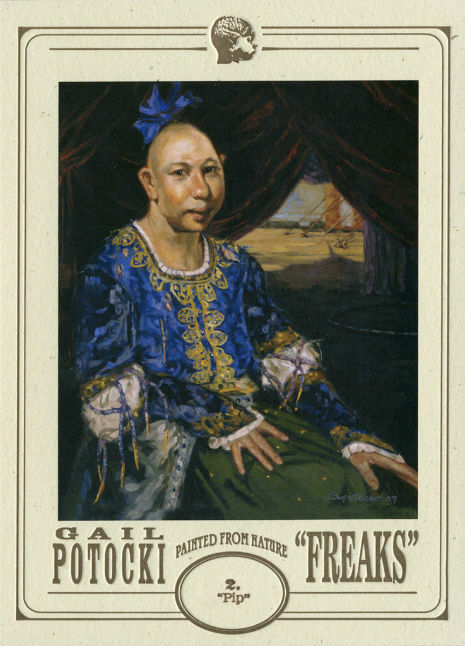 Behold the first five paintings of Gail’s Freaks series as they appear in a set of astonishing trading cards. 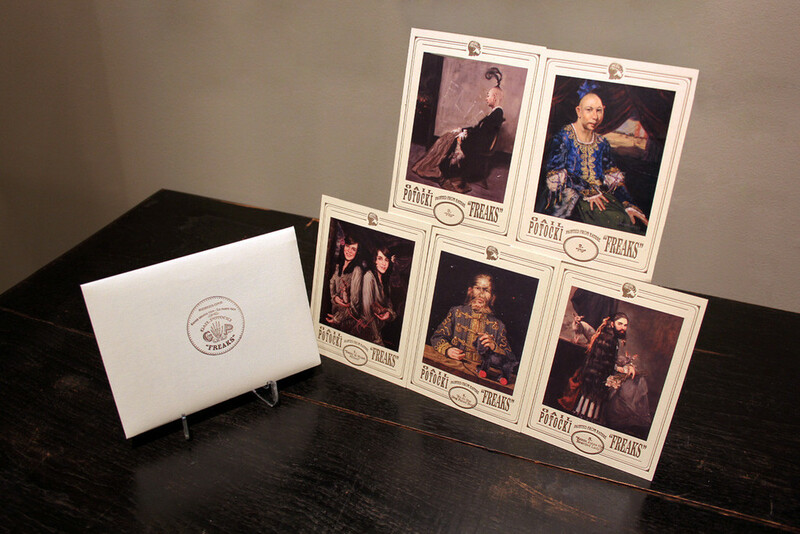 Beautifully designed to recall the look and feel of Victorian Era carte de visites, these cards elevate card collecting to a level of sophistication and eccentricity that is too magnificent to be ignored! 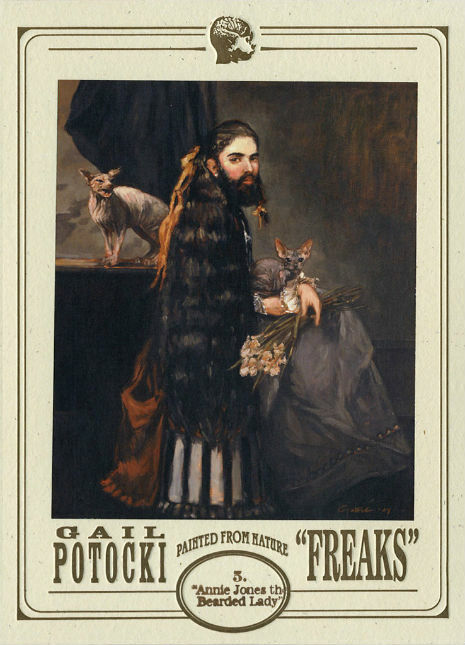 Gail Potocki‘s Freaks trading cards can be purchased by clicking HERE! 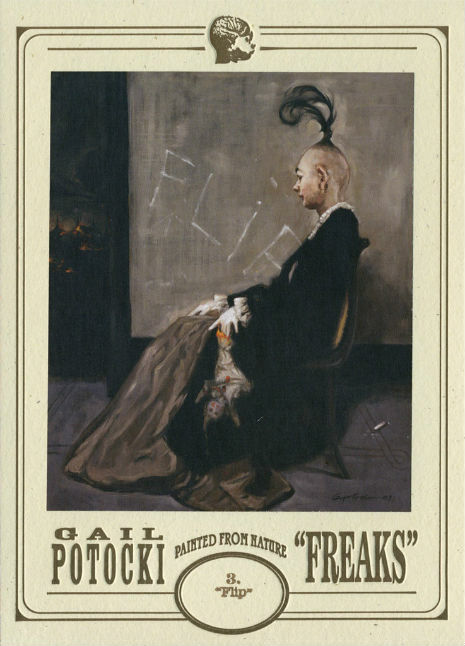 Series I of Gail Potocki’s “Freaks” collectible trading card collection. Each set of cards comes in an envelope hand stamped and signed by Gail Potocki herself and numbered 1-100, so they are very limited in availability, and sure to become a highly sought after collectible. So, indulge your inner freak and purchase yours now! And the Freaks t-shirts can be purchased by clicking HERE! 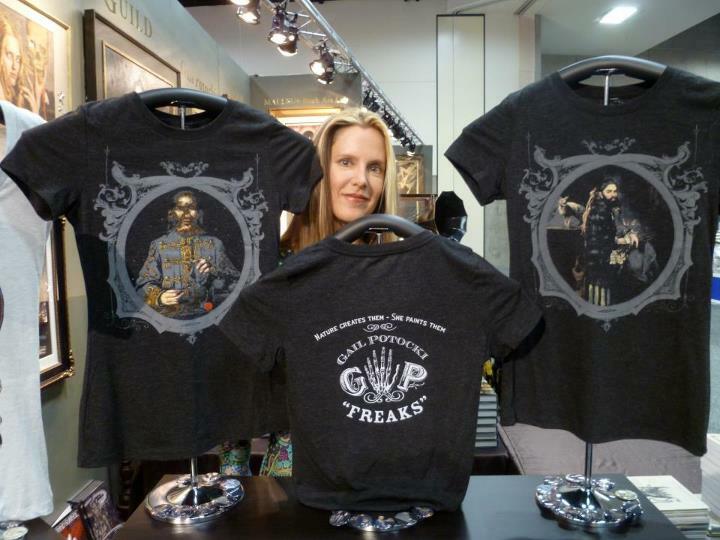 Gail and her elegantly designed Freak t-shirts at the 2012 San Diego Comic-Con. Available in both men’s and women’s sizes small, medium, large, and extra large, these shirts were produced in a very limited number of 85 each gender. Stylish, unique, and very comfortable, these dark grey crew neck t-shirts are made from 100% cotton and screened from high resolution in order to capture as much quality of the original paintings as possible. The memorable wedding banquet scene of “Freaks” where the lives of the normal circus performers and the sideshow freaks collide. It is in this mundane setting of socialization and food consumption, of physical and emotional nourishment, where the perceived worlds of normalcy and abnormality clash with dramatic results. And what better metaphor is there for the conflict between the individual and the collective, the obscure and the celebrity, the hero and the villain? Maybe in the end we’re all just freaks in the circus of life. Maybe that’s what makes us beautiful. This entry was posted on 8 April, 2013 at 9:44 am and is filed under Century Guild Contemporary, Gail Potocki, San Diego Comic Con, Uncategorized with tags Century Guild Contemporary, Circus and Carnivals, Collectibles, Exploitation Films, Freaks, Gail Potocki, Merchandise, Symbolism. You can follow any responses to this entry through the RSS 2.0 feed. You can leave a response, or trackback from your own site.